No matter how many precautions are taken, nobody is completely invulnerable to problems with the equipment or the equilibrium in an aquarium. An electric power cut, for example, has no dramatic consequences over a short period, but it is worrying if it lasts a whole day (rarely the case, it is true). The aquarium cools, but the heat loss can be reduced by wrapping the tank in a blanket (also the solution to any malfunctioning of the heating system). Generally speaking, in the event of a power cut there is a danger that the water stagnating in the filter will acquire substances that are toxic to the fish. It is therefore very important to empty it before turning the power back on and putting the filter back into operation. An abnormal increase in the temperature can occur if the thermostat gets stuck in the heating position. The only real solution is to unplug it and adjust it, and allow the temperature to slowly drop to its initial level. The temperature can also go up in summer, depending on the room where the aquarium is housed. The thermostat obviously turns the heating off, but the temperature can still sometimes exceed 25-26°C. There is no need to panic up to the 27-28°C level, but you must make provisions for cooling the room by darkening it, to avoid the penetration of sunlight. Note that substituting part of the water with domestic water or putting ice cubes in the aquarium have little effect. The water color is a good indicator of the equilibrium of the aquarium: if it is clear and transparent, there are apparently no problems, but any coloring may be the sign of imbalance. A drop in the pH is often the result of an excess of carbon dioxide dissolved in the water. This can be solved by increasing the rate of aeration. Finally, you must be prepared for a rare accident, such as a leak, or a cracked pane. If this happens, you must act quickly, transferring the plants and fish to another tank, with their original water. 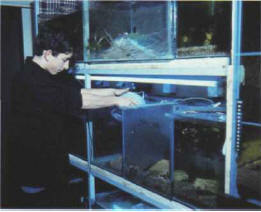 A young hobbyist and aquarium dub member remounting several tanks. The aquarium must then be completely emptied and dried, and you must locate and block the leak or change the cracked pane, using the gluing techniques. A well-balanced aquarium can be self-sufficient for up to one year, or even more, if it is maintained on a regular basis. If this is not the case, remounting must be considered. This can also be done when you want to change the decor, move the aquarium, or even move home. Plants and fish must be stored in another tank, with their original water. Then take out all the non-living elements, and clean and store them until they are used again. Now comes the turn of the actual aquarium. Start to put it back into operation by reintroducing fresh water of the appropriate kind. If the aquarium is to be remounted in a single day, it is advisable not to wash all the sand that serves as a bed, as it contains the good bacteria needed to undertake the nitrogen cycle. A rough rinse will get rid of the bigger pieces of debris, with only the top layer being cleaned several times, until the water is clear, for a good visual effect. Think big: the greater the volume of the tank, the easier it will be to maintain its balance, especially with sea water. Make provisions for good filtration and aeration. Consider planting the aquarium, even with sea water: many beginners do not put enough plants in their tanks. Start with robust fish, easy to raise and recommended for novices: these are not unattractive, and are often found to be the least expensive. Regularly monitor the temperature, the pH, the nitrites, the hardness (in fresh water) or the density (in sea water). Regularly siphon and change part of the water. ХОНГАЙ (Hon Gai) , город на северо-востоке Вьетнама, административный центр пров. Куангнинь, порт в зал. Бакбо Южно-Китайского м. 123 тыс. жителей (1989). Центр каменноугольного бассейна. Химическая, металлообрабатывающая и металлургическая промышленность.